I've had the GS for a couple of months now and I feel pretty confident I've gotten the bulk of the repairs made or nearing completion. The list isn't long but some of the parts have been expensive and some of the lessons I've learned have been equally costly. The GS is still on the lift but, with a bit more effort and prompt delivery by FedEx and Amazon, I should have everything buttoned up before the New Year holiday! In addition to buying and installing parts I've also discovered a local welder and also discovered that vintage motorcycles and a cheapskate owner are a bad mix. I'm not much for New Year's resolutions but I do need to change my mindset going forward. As the old saying goes, the cheapest thing on a BMW motorcycle is the rider and I fell victim to that old adage right out of the gate. 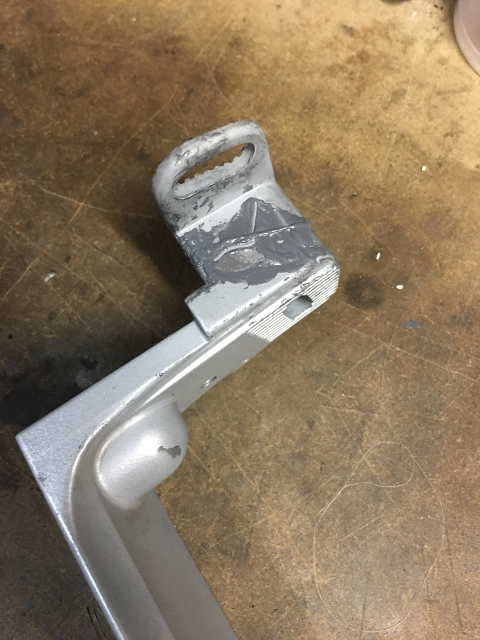 I made an attempt at salvaging a part by using JB Weld but the part didn't survive reassembly. With that lesson in mind I pointed my browser at Bob's BMW microfiche and ordered up a new replacement part. 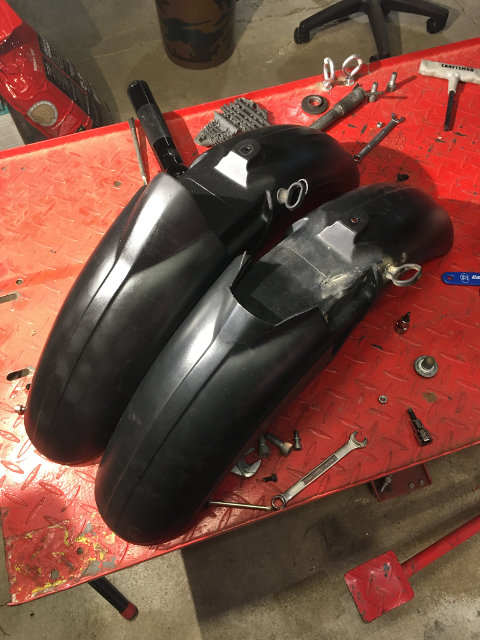 I'm going to have to take the fairing bodywork off the bike again but this will reinforce the lesson that trying to save a buck costs me more time in the end. If time is money I squandered my money reinstalling a broken part rather than spending money on a new part. I also talked to a local welder about my broken part discoveries - Dave's Welding & Restoration. Dave put it best when he said "motorcycles are all stress." While JB Weld solves some problems in some situations, it wasn't the right tool for these jobs. Fortunately I figured that out on the lift rather than on the road. This is a great example of me coming to terms with two diametrically opposed forces - my love of vintage motorcycles and being a cheapskate. 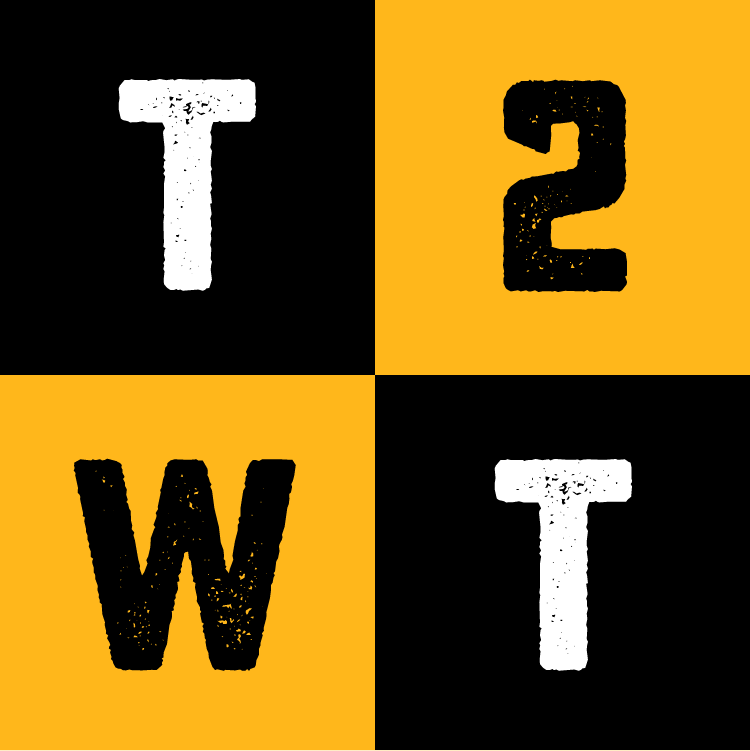 These two realities cannot coexist. I'm going to have to make a change. I can either continue to ride vintage motorcycles or I can continue to be a cheapskate, but I cannot be both. Given I moved back in time when I acquired the GS it seems clear I cannot give up on vintage motorcycles so I'm going to have to break my cheapskate ways when it comes to the motorcycles. 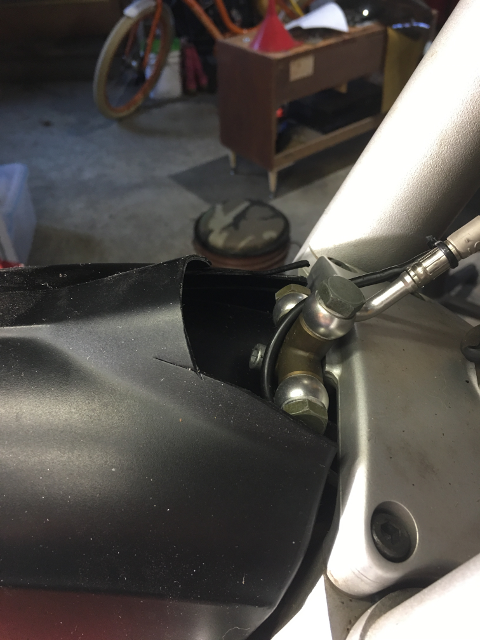 One of the previous owners (PO) of the GS upgraded to braided stainless steel brake lines but during the installation s/he cut some corners by cutting up the front fender. While this really didn't hurt anything, it wasn't "correct" so I decided to look for a replacement fender. I took a look at the microfiche at Bob's BMW but it didn't appear that a replacement front fender was immediately available so I turned to eBay. 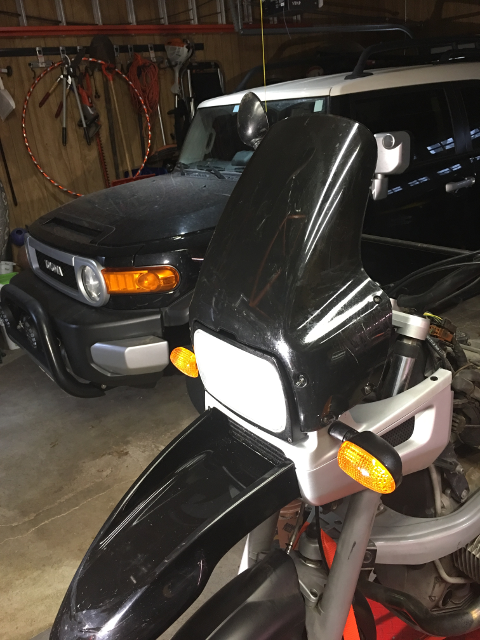 I found a previously enjoyed front fender and ordered it up. Even though this was purely cosmetic, replacing the cut fender with a complete one just looks better. The side-by-side comparison confirms that this was the right decision. I suspect the amount of time the PO spent getting out the Dremel tool and chopping the fender was probably about the same as removing and replacing the front wheel and fender but everyone makes their own decisions. 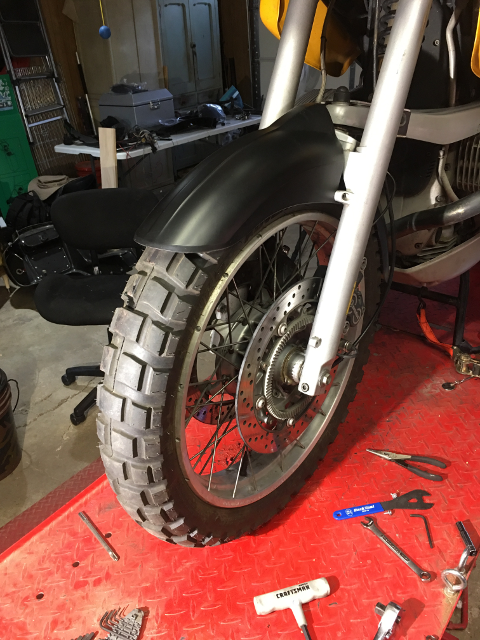 I opted for removing the front wheel and installing a previously-enjoyed and complete fender. The after picture makes me happy! I like crash bars. Otus has crash bars and I'd like to have crash bars on the GS as well. I bought a set of previously-enjoyed crash bars only to discover that they had not only been previously owned but also previously crashed. When I attempted to install them I discovered they were bent just enough to prevent them from fitting, so another cheapskate lesson learned. Tank's Off - Do Stuff! Pulling the tank isn't hard but it is messy, heavy, and inconvenient. 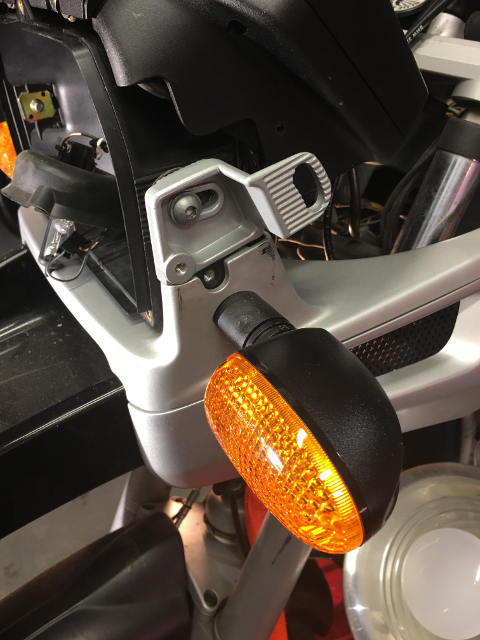 The messy part is that the 1995 GS doesn't have quick connect fittings on the fuel line like the 2003 R did. I was as prepared to plug the fuel lines after disconnecting them but I still managed to a bit of a gas spill and end up with stinky shoes. Once the lines were plugged, the electrical lead for the fuel pump, and the single bolt were removed the tank came up fairly easily. I then had to think on my feet to get the ground wire disconnected and the vent lines disconnected without dropping anything. If you pay attention disassembly is good training for reassembly and I'm pretty sure I was paying attention. Pulling the tank was heavy because it wasn't empty. I resisted the urge to let the fuel run completely out on the garage floor and plugged the lines. I'll be draining the rest of the fuel before everything goes back together because an empty tank will be much easier to install. Besides, the chain saw needs fuel for the winter so this will be good donor fuel. Pulling the tank is just inconvenient - especially when compared to pulling the tank on Otus. Lots to disconnect and wrangle and I'm lazy! Mess, weight, and inconvenience aside, pulling the tank makes several other jobs easier so off it came. 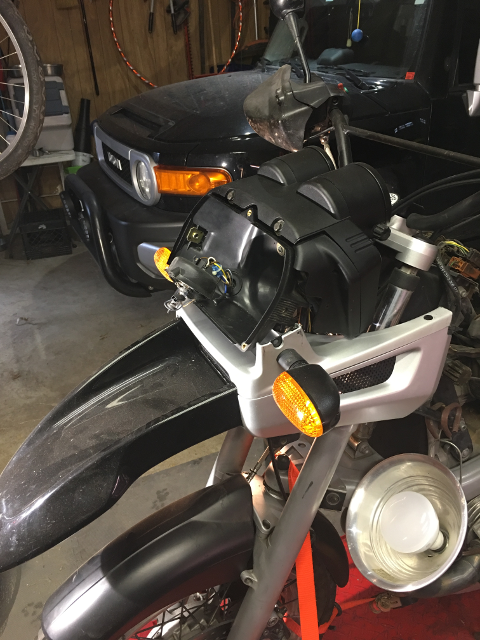 I originally decided to pull the tank to make installing the crash bars easier but that was effort poorly spent given the crash bars were bent just enough to keep them from installing correctly. But because I was planning on pulling the tank, and the PO mentioned the battery was old, and didn't know when the fuel filter was replaced last, I knew the total effort would be good overall. 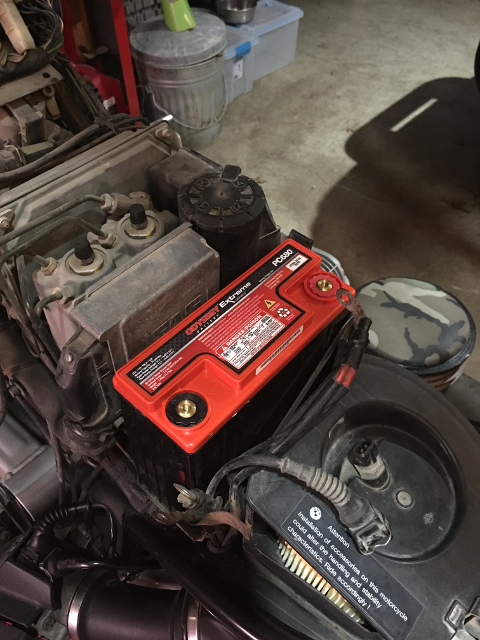 A new Odyssey battery has been dropped in along with a new air filter. I'll be installing the usual Dual Port Power Socket a new fuel filter. 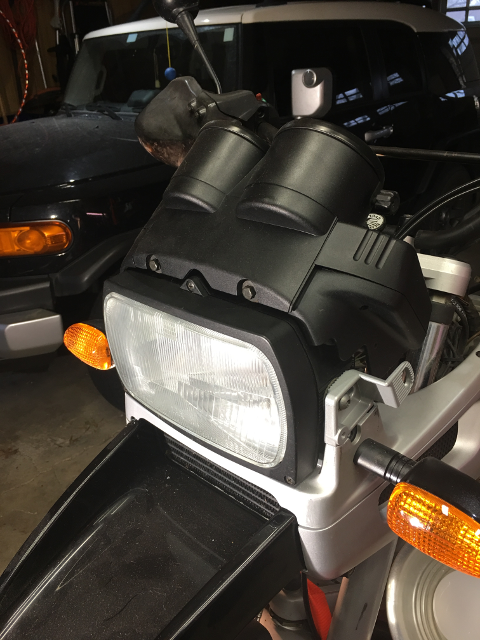 I was trying to make sense of the new Jesse top case I bought to add to the GS when I noticed that the seat lock was moving all around when I unlocked the pillion seat. With the seat off I could see what was going on - the seat "catch" assembly (not the lock core but the bar with the levers to catch and hold both seats) had been broken and was being held in place using zip ties. Zip ties, along with JB Weld, are a great invention, but not when used to solve this particular problem. I bet you can guess what happened next - I jumped back on Bob's BMW website, went to the microfiche, and order up a replacement part. I didn't so much care about being able to lock the seats on the GS (although I'd hate it if they got stolen while I was out and about) but more than anything I wanted to make sure the seats stayed put. This replacement bit solves this problem. 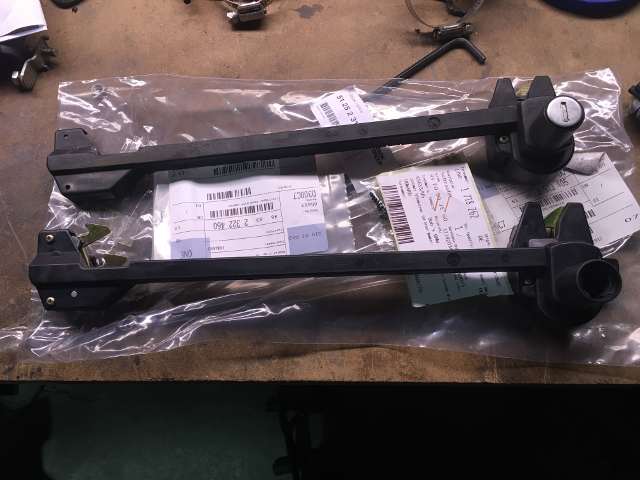 This part had to be shipped from places unknown but arrived at the top of the day and will be the next bit installed. 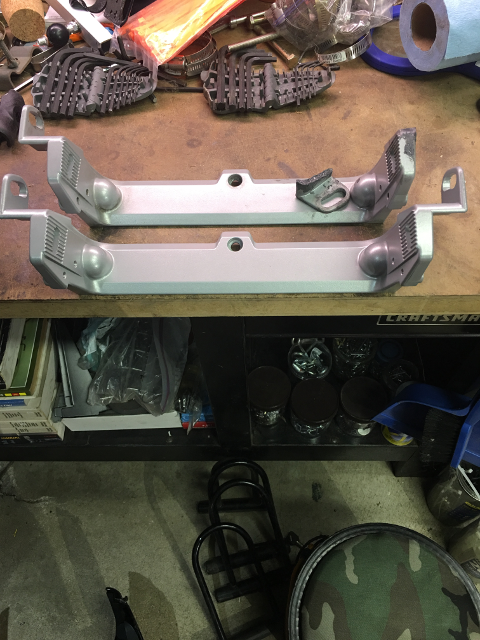 Once this is installed I'll be able to refresh the seals on the Jesse bags (yeah, I could have done that while I was waiting for this part but I also like to work on the website, drink beer, and be lazy too), re-install the repaired luggage rack, and install the new top case. More pictures to follow as the part is installed and the luggage comes together.